Full Sail - Brewery & Restaurant. Full Sail was one of the breweries that started Oregon’s beer revolution. Founded in 1987 in a derelict cannery in Hood River and honoring the then new wind sport culture, Full Sail is still going strong 29 years later. Try the old stand-by Full Sail Amber or light and tasty Session Lager. Take a tour and meet the people behind the pints, learn about crafting beer, see the local ingredients and learn about their sustainable brewing practices. Tours are free of charge daily at 1, 2, 3 and 4 pm. Double Mountain - Brewery & Restaurant. The pizza at Double Mountain Brewing & Taproom in the scenic town of Hood River is the best wood fired pie in the area, if not the state, and the beer is awesome. Try the Vaporizer dry-hopped pale ale. Fort George Brewery - Score a fir-infused Magnanimous IPA in the shadow of Fort George's giant fermenters. Also on the site is Fort Astoria (15th and Exchange streets), the site where John Jacob Astor's fur traders originally constructed their post in 1811. Special thanks to Hop in the Saddle-A Guide to Portland's Craft Beer Scene, for their many special suggestions. You may view our guide to enjoying alcohol responsibly. View the Barfly Happy Hour here. Enjoy Touring Limos Custom-Designed for Panoramic City Viewing. 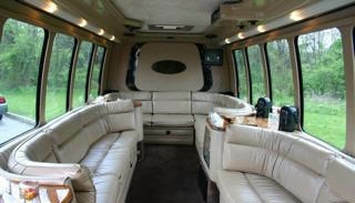 Travel in style and comfort in our 12/16-passenger Limo Brew Bus or any of our other vehicles. See the city through the oversized windows, stretch out with ample leg room & 6' 4" standing room and tour comfortably with luxury interior and deluxe air-conditioning.